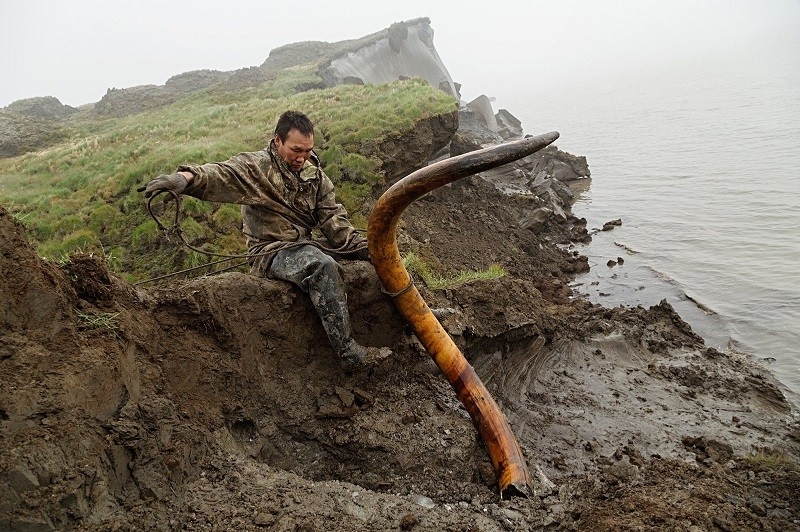 We had never heard of Beringia. But, now that we know about it, we think it's important for other travelers to this region to know some of the ancient history of how Alaska and Yukon came about... before, during, and after the last ice age. Along the Alaska Highway, right in front of the Whitehorse airport, there's an attraction called The Yukon Beringia Interpretive Centre. The Yukon Beringia Interpretive Centre. They have lots of parking for RV's! 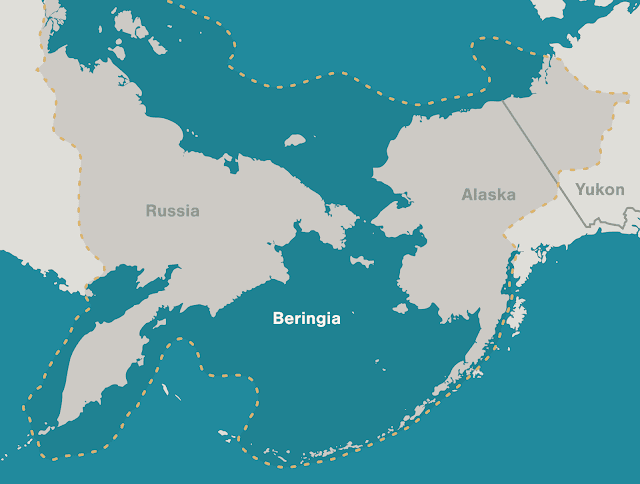 Beringia is the mass of land that would have existed during the last ice age when sea levels were much lower. It connected the area that is now separated by the Bering Straight. Also important to note, is that this land mass was never covered in snow and glaciers by the ice age because of it's position with regards to the surrounding mountains. This became a nice grass plain rich in minerals that kept the woolly mommoths alive as well as many other creatures including today's caribou. It costs $6.00 CAD ($4.75 USD) for adult admission. That's pretty good value, considering we spent just over two hours there! They have some displays, and they show two films. We watched the 10:30am showing of "Land of the Mammoths". Then our guide David gave us a talk on human migration through the area and then we watched the shorter film "Imagine Beringia" at 11:45am. There are books written about Beringia. We went back to the motorhome and had some lunch, and then we went right next door to the Yukon Transportation Museum. At $10 per adult, we thought it was a little overpriced, but at least they had a Seniors discount available to anybody over 55 that brought it down to $8. Also, you can buy a Combo Pass that allows entry to both the Beringia Centre and the Transportation Museum (they are located beside each other) for $12. This mounted airplane is a weather vane! It moves with the direction of the wind! Various modes of Yukon transportation. Model display of Whitehorse back in the day. Some interesting stuff, including one display about a plane crash back in 1963 where a 21 year old woman and her 46 year old pilot survived 49 days in the frozen bush. Amazing stuff. Apparently it was front page news around the world at the time. Interestingly, the plane actually crashed in British Columbia, but very close to the Yukon border. It rained overnight, and it's still raining steady here in Whitehorse this morning. We should have saved those two attractions for today! Oh well. We're going to the Yukon Wildlife Preserve today. Hopefully the rain will hold off while we do the 5 km hike there. And then the Takhini Hot Springs this afternoon! That story sounds so familiar about Lost in the Yukon, I might have seen it as a kid. That CP plane weathervane is the absolute coolest! I don't think we had ever seen it but we now want to see if we can get a copy of either the book or the movie. That weather vane was really neat. Amazing that it only needs a wind as strong at 5 knots to move the plane! Very interesting places you are visiting. Too bad you have a fair amount of rain lately. Be safe. Some wonderful places to visit there and glad that you are taking the time and giving us tips if we manage to get up that way. We have been finding some neat things to see for sure and learning more about the north that we never knew before. We think everyone needs to make a trip up here at least once in their lives. Funny, we have a friend visiting here from Calgary and we went to a local museum with a "manut" display. What a coincidence, too funny! If a plane crashes in BC, but very close to the Yukon border, where do they...oh never mind. Unless you do a tour like you did one would never know about the changes of the land structure and the Mammoths. We surely didn't learn that in school. Now with Sherman being all fixed up your trip should be more Care-Free. That or you took up Geography or some other courses in university where you learn this stuff. We are really glad that we stopped in at the museum, it certainly gives us a better understanding of Alaska, Yukon and norther Sibera and what it would have looked like back in the Ice Age. Sherman is quite happy with his new repair, he is certainly much quieter to drive when he is on rougher roads. Oh! So happy to hear and read about your tours to those museums...they were closed for renovations when we were there...fascinating history about Beringia...thanks again for your travelogues. Safe travels. We enjoyed both museums but the Beringia one was the best. Sure learned about an ancient area/land that we had never heard about before.